The 28 tiny satellites that will make up Planet Labs' "Flock 1" constellation of Earth-imaging spacecraft. The world's biggest constellation of Earth-imaging satellites has arrived at its launch site in preparation for liftoff just a few weeks from now. 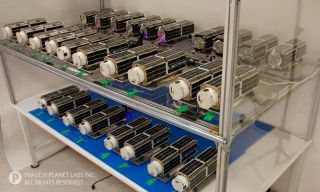 San Francisco-based startup Planet Labs delivered the 28 tiny satellites that will make up its "Flock 1" fleet to NASA's Wallops Flight Facility in Virginia earlier this month. The constellation is slated to blast off for the International Space Station aboard a private cargo vessel on Dec. 15, then be deployed from the orbiting lab a month or so later, Planet Labs officials said. "We'll be producing imagery of the whole Earth with unprecedented frequency," Planet Labs co-founder Will Marshall told SPACE.com. "We will thus be able to always be covering the whole Earth, not just pointing and shooting at specific targets." The 28 satellites that make up Flock 1 measure just 12 inches long by 4 inches wide by 4 inches tall (30 by 10 by 10 centimeters), but they can take images with a resolution of 10 to 16.5 feet (3 to 5 meters), Planet Labs officials say. The "cubesats" will ride inside private spaceflight firm Orbital Sciences' robotic Cygnus vessel, which is slated to launch on its first contracted cargo run to the space station for NASA on Dec. 15 aboard Orbital's Antares rocket. The Flock 1 spacecraft will likely be ejected from the orbiting lab in mid-January, Marshall said. The Antares lauch won't mark Planet Labs' first space mission. The company lofted two prototype Earth-imaging cubesats, called Dove 1 and Dove 2, back in April and blasted two more advanced versions into orbit just last week. These latter two, known as Dove 3 and Dove 4, lifted off aboard a Russian Dnepr rocket on Nov. 21 as part of a record-breaking launch that carried a total of 32 satellites to orbit. The first two Dove demonstration missions helped prove out and further inform the design of the Flock 1 fleet. Data from the newly launched Dove 3 and 4, meanwhile, may be used to update or improve the software of the big constellation when it's on orbit, Marshall said. Planet Labs has high hopes for Flock 1, saying the fleet could help change the current paradigm in which high-quality Earth-observation data tends to be gathered by large, expensive spacecraft that take years to build. "We built them at an unprecedented rate, and we did it as a production," Marshall said of the Flock 1 satellites, noting that rapid production is not the norm in the space sector.